Takeaway: Miscalculating fall arrest distance can have serious consequences. Whether you are working in a cradle, on scaffolding or performing any other type of work at heights, the fall arrest system is of no help if you reach the ground before your fall is stopped. Although it sounds obvious, we unfortunately see all too often inadequate fall arrest systems. The source of the problem is usually a lack of training or a solution developed without the assistance of a qualified person. Miscalculating the fall arrest distance always leads to the same result: injuries or death. Many workers don’t fully understand how a fall arrest system works and don’t adjust the system according to the actual data of the situation. Often, when adding the length of the safety harness, the lanyard, the anchorage as well as the height of the worker, the total length can cause injuries. Therefore, to learn how to efficiently calculate the fall distance and leave the necessary clearance is crucial. A fall arrest system (personal protective equipment for working at heights) is essentially composed of three integral elements: a body harness, a fall-arrest device (lifeline, shock absorber, carabiner, connector, cable, etc.) and an anchorage system. The greater the free fall distance, the more energy the fall will produce and the more violent will be the shock. The free fall is the distance travelled during a fall before the fall arrest system is triggered. It is important to minimize the free fall distance (maximum of 1.8 meter according to the CSTC). In order to achieve this, the user must, whenever possible, attach his lanyard to an anchorage connection point just above his shoulders. In case of a fall, this will reduce the impact force, the risks of contact with an obstacle and the injury severity while facilitating emergency and rescue operations. Specific anchorage points should be located directly above the user – “above” in order to reduce the fall distance and “directly” to minimize the pendular movements. The risk of swing fall increases in direct relation with the horizontal distance between the user’s harness and his anchorage connection point. For that reason, anchors (on the roof) must not be spaced more than 3 meters (10 feet) in between on a right angle from the building’s facade, and applied along the traction axis corresponding to the worker’s potential fall. Also, the angle created by the offset must not be over 22 degrees. For an untrained worker, a lanyard of six feet may seem enough when working at a height of 10 or 12 feet. Still, the length of the harness and the anchorage connectors must be added. A fixed anchor is easy to calculate as the only distance to add is the ring. However, when the anchor is part of a horizontal lifeline, the calculation is more complex. Horizontal lifelines are not tight in their initial design and can stretch in the event of a fall. This collapse must be taken into account. Calculating the collapse may be as simple as tightening the rope to calculate the distance, but determining the collapse during a fall is more complicated. The force applied on a lifeline will pull it farther than you could measure when only tightening the line. In average, calculate about 3% of the total length of the tight line to 15% of the length of a lifeline using a shock absorber. Ideally, an engineer should calculate the collapse for a fall according to the number of people attached to the lifeline. We often forget the deceleration device. When deployed, it adds 3.5 feet more to the length of the lanyard. Also, the harness can stretch so the anchorage point is moved higher than the head during a fall. In this example, the distance to be considered is not 6 feet, but 10.5 feet. 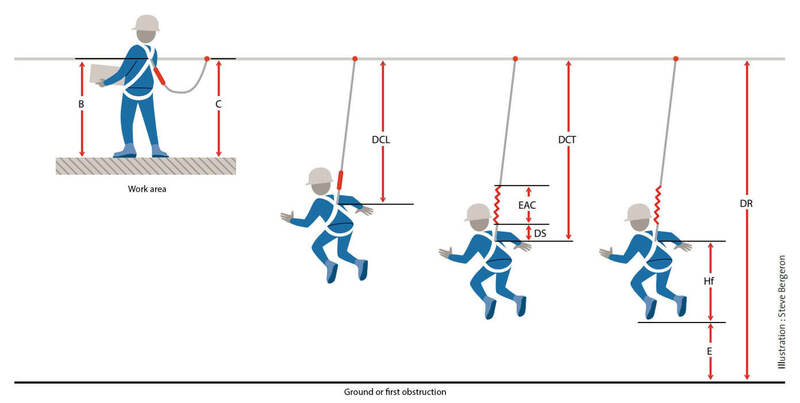 Although apparently simple, this information is often overlooked when calculating the fall arrest distance. It is imperative to take the height of the worker under the anchorage point into account. A fall arrest system that stops a worker at 12 feet is not efficient when the lowest level is 14 feet, unless the worker is less than 2 feet tall, which is highly unlikely! On average, at least 5 feet must be added to the calculation to take into account the person’s height. The section 8 of the CSA Z259.16-04 standard: Design of Active Fall-Protection Systems, offers the necessary guidelines to evaluate the required clearance underneath the worker using a fall protection anchorage system. In most cases, the required minimum clearance for using a harness as a fall prevention device must be greater than 4.5 meters (15 feet). Add the safety factor before the nearest obstruction. This post originally appeared on SPI Health and Safety's blog. It has been republished with permission. Choosing the Right Fall Protection Lanyard - Choosing the right lanyard is as important as choosing the right harness. Find out what you should consider when equipping your fall protection or fall arrest system.